make it perfect: .Not happy, drugs and an apron. .Not happy, drugs and an apron. Lots of wind and a very sore tummy. But he has been good the last 2 nights so he can have a cry day today because I don' feel tired. Lil did not get better. Sunday she was really bad. Took her to our GP first thing Monday morning. He said bad ear infection and chest infection. 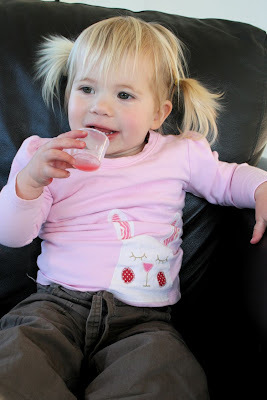 On antibiotics now and a new little girl. I am probably the last person around to sew an Emmeline Apron. Check out the pics in Sew Liberated's Flickr group. 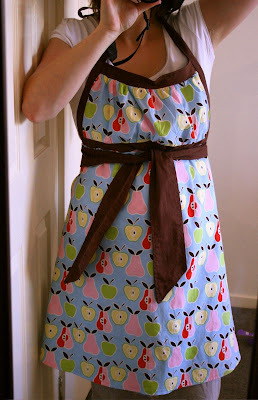 I finished this apron while I was pregnant, modelling it with a large tummy looked very frumpy. Reversible too so if I make too much mess I can flip it over! I really feel for you Toni. Adore the apron. It would make the kitchen a much happier place for me personally. Hope the kids feel better soon, and you all get some sleep. Poor Lil, good to know the medicine is helping. That happened to us last year it took two trips to the doctor before they picked up Darcy's ear infection. A mother always knows!!! Hope Tommy continues to sleep well at night. Awwwwww....look at Tommy's bottom lip. That's adorable. Beautiful apron- you are SO CLEVER !! I have never made an Emmeline either, but I must say that it is an adorable apron. You even used one of my favorites fabrics--the AH pears and apples. I have about 3 yards of that one stashed away. Poor Tommy, he looks so sad in that photo. I'm glad Lil is picking up a bit and your aprons are so gorgeous, I want one! 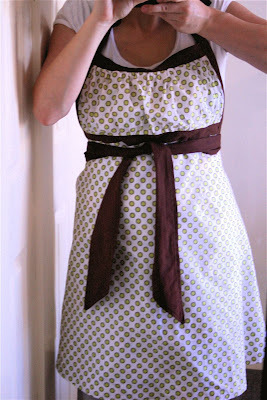 The apron looks lovely and you are not the last person to make it because I haven't made one yet! :D I hope Tommy is feeling better today and Lil is recovering.